Dr. Daniel Kwasi Adjekum has over twenty (22) years of experience as a former Ghana Airforce squadron commander (Presidential Fleet), airline pilot and aviation safety consultant. He has an airline transport pilot license (ATP) and type- rated on the Fokker F-27 and Boeing 737 (300-800) series aircraft. Dr. Adjekum is an International Civil Aviation Organization (ICAO) designated subject -matter expert in flight safety and an International Air Transport Association (IATA) certified Safety Management Systems (SMS) implementation and control expert. He is also a graduate of the United States Airforce Safety Center International Flight Safety Officers Course. He also had aircraft accident investigation training with the United States Naval Safety Center. He holds a Master of Science in Aviation and a Doctor of Philosophy (PhD) in Aerospace Sciences from the University of North Dakota. He is a certified safety professional (CSP) accredited by the Board of Safety Professionals (BCSP) of the United States. Dr. Adjekum is currently an assistant professor at the aviation department (UND) teaching courses in crew resource management, safety management systems, and human factors. 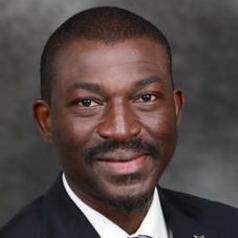 Dr. Adjekum also teaches statistics and advanced quantitative methods at the graduate level and has been a principal investigator (PI) for an inter-collegiate research initiative on aviation safety culture and safety management systems. Dr. Adjekum consults extensively for the Government of Ghana on aviation matters and has been a prime consultant safety management systems implementation for the Ghana Airforce and other aviation organizations in Ghana. He has also worked on SMS implementation projects for Virgin Nigeria Airlines and UND Aviation. He has published extensively in peer-reviewed academic journals and presented at academic conferences and industry workshops both in Ghana and the US. He has conducted a safety assessment/audit of the Ghana Airforce Maintenance Safety Program and a post –project standards compliance and certification/acceptance requirements for a new hangar facility. He recently (July 2018) conducted a Human Factors Workshop for aviation personnel of the Ghana Airforce and allied civil aviation entities. The evidence-based training focused on strategies to minimize operational errors due to human factors and operational performance limitations. It also geared at ensuring proactive safety in aviation operations.